I have read a lot of romance so when I come across similar plot lines or character tropes, I have to control my eye rolls. 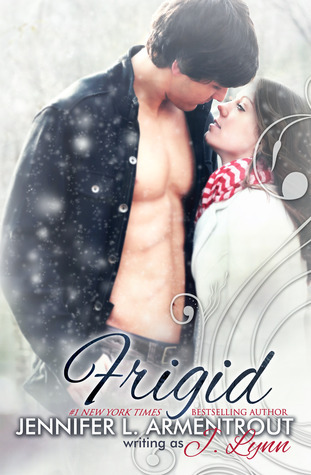 When I began reading Frigid, I felt my eyes reaching for the stars at times. J. Lynn's writing kept me reading. I'm glad she gave us dual point-of-views of both best friends Syd and Kyler. Honestly, I would have liked to hear more from Kyler, being stuck with Syd did make me groan, a lot. Syd is a good girl with a sense of humor and the hots for Kyler. He first comes across as a total player, a complete man whore, so what does Syd see in him? By the time they're stranded I got it. It must be hard growing up in love with your best friend and watching him hook up with so many females and not you. Kyler didn't think he was good enough to deserve someone like Syd, she stood for everything he wasn't. Even though Syd annoyed me a lot and their lack of communication ticked me off, I kept on reading. J. Lynn has this way of fleshing out her characters and making them so real (complete with things to bug a reader). Even when I was frustrated by Syd or wanting to smack Kyler, I was still attached to every word on the page. It takes getting snowbound inside his parent's ski house to finally draw these two out of their proverbial silly shells and into the real world of revealing feelings and being honest. I'm not sure the added someone's out to get them by breaking windows was necessary. As much as I became a fan of the author's writing, I just wasn't crazy about these characters and their story. I didn't connect with either, though I wound up liking Kyler more. Perhaps if there was more of their friendship leading up to their being stranded, I would have wound up loving this book. Otherwise, I'm afraid Frigid left me out in the cold. I absolutely HATED this book. It got 2 stars from me and I think I was being quite generous with the rating. Kyler and Sydney were obnoxious and there was never really any explanation as to WHY Sydney fell for Kyler. There was at least one double standard issue for me as well.